Need a little sweetness in your life??? Well, Bad Girls Kits has a kit for you this month! 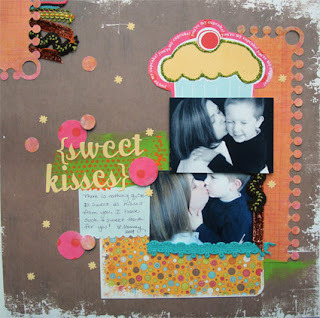 The main kit is full of sweet treats and yummy papers. The addons are just as sweet and are full of delish details and playful colors. Here are my layouts and projects using the main kit and some add on features! 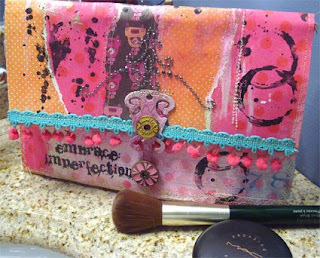 Project- Clutch purse made from papers, paint, plastic bags and grungeboard! Also, check out the Special Edition February Valentine's kit! It's gorgeous with lots of bling! Snap it up fast because this one is sure to go fast! Okay, update on the family... we are doing great. Christopher is a great eater, sleeper, and pooper! I swear he smiles at me! It is NOT gas and I refuse to believe it's not on purpose! I love this little bundle of sweetness so much! Mark is adjusting slowly but is definately having some behavior issues to gain attention. I feel bad that he feels like he has to do that. It's frustrating and Matt is not as patient with him as he needs to be. I know it's a phase and he will get over it, but I feel bad about it. He does love the baby though and kisses him all the time. It's hard to resist that face. So, we will plug along and hope he gets over the jealousy and need to act out. Remember, my word of the year was Patience...? Well, it's being tested, but I will persevere! He is in school all week so that gives me lots of time with Christopher and a reprieve from having to be too patient. I love my boys so much it hurts! Thanks for letting a hormonal mommy vent! Your work this month was insanely creative and inspiring. And little Christopher is so precious. I can't wait to watch him grow. 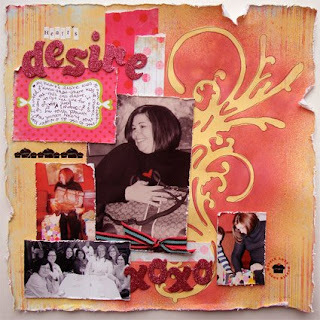 AWEsome work with the kit Jen! That project was INSANE! wow those layouts are to die for... you are dripping talent girl!